Are you pushing 50 – or (like me) are you well past that? I’ll bet you’ve heard about the tremendous benefits of exercise and weight training . . . how seniors may slow the aging process and retain – or even reclaim – much of the strength and fitness of youth. Well, it really is true. I’m Logan Franklin. I know that you want honest and realistic exercise and fitness information, explained in plain, non-technical language. And I promise you will not be insulted with exaggerated claims or secret potions. Prove it to yourself. Click on any category of interest in the column to your left for a wealth of solid and reliable information. At Senior Exercise Central, you'll discover . . . Weight Training: The most effective progressive resistance training methods and how to get started. Cardiovascular Exercise: The latest information on keeping your heart and lungs healthy. Flexibility Options: Stretching, yoga, Pilates, Tai Chi, and Qigong. Real World Nutrition: How to normalize your body weight while providing energy and the muscle building nutrients you need — without fad diets. Supplements: Which ones to consider – with your doctor’s approval – and which ones may be worthless or even dangerous. Home Gyms: Should you develop your own gym or join a health club? What equipment will you need to workout at home? Your options and answers are here. Beginning weight training for seniors is an age appropriate starter program. What that means is that after age 50, training progression for beginners purposely moves at a little slower rate than it might for a younger person. I'll show you how to begin. Doing too much too soon will in the long run hinder your progress. Go here. Staying up to date on the latest health information and reliable medical resources is an important part of a healthy lifestyle at Senior Exercise Central. 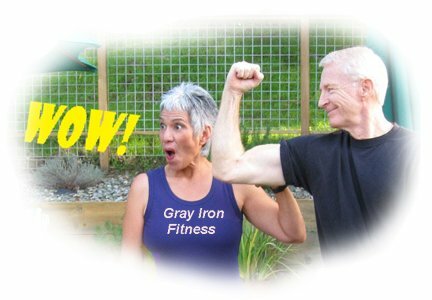 Policy Notes: Like newspapers, magazines and television, Senior Exercise Central and the Gray Iron Fitness Newsletter contain advertising and affiliate marketing links. The newsletter and Senior Exercise Central provide information to help users establish and maintain a fitness lifestyle. But fitness information is not the same as fitness advice, which is the application of exercise and dietary practices to an individual's specific circumstances. Therefore, always consult with your physician for assurance that fitness information, and your interpretation of it, is appropriate for you.